There is very little that comes from Spokane, Washington that can be considered “great” or even “notable.” With that understanding, imagine my surprise to hear something unrelated with Gonzaga Men’s Basketball or Craig T. Nelson come from the Inland Northwest worth taking note. Very interested, but admittedly, I set my sights rather low. Singer/Songwriter Jerad Finck is the biggest thing to come from the Eastern Washington town since Vision Quest. His audible presence is large and his style is ranging and notable. 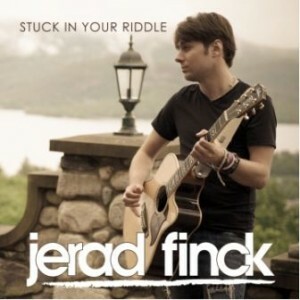 Holding near to a simple acoustically driven foundation, Finck releases Stuck In Your Riddle on CD October 23rd. Jerad Finck’s sound is a refreshing break from the oversaturated Jack Johnson’s and John Mayer’s of the world today. Stuck In Your Riddle is deceiving and a masterful sleight of hand; so much so, I can’t help but smile. Everything about Finck’s record feels utterly pop. Fittingly his music has been used on HBO, Discovery, CBS and ESPN. It is made for mainstream. It is exactly that reason which makes me smile. Finck’s airy vocals, precise instrumental s and easy-to-swallow lyrics make each track the perfect option for productions to lean on in a desperate moment of “originality.” By doing so, they’ll miss the point, but we’d get more Jerad Finck. Approach it with a “win-win” mentality and we’ll all be fine. “Won’t Give up” is perfectly formed for a primetime drama moment of lovers quarrel. Next, the self-titled track fits perfectly in a teenage moment of self-discovery. “Beautiful,” though a tricky one to place, finds comfort in a scripted intimate moment of passion. Its exotic rhythm and use of maracas would easily set the mood. “Can’t Stop,” picking up the pace instrumentally, delivered with a slight vocal difference queues a rain soaked montage of either devoted sports fans or a Zach Braff love story. “Runaway” ties everything together as a perfect theme song to, honestly, about anything you can imagine. Uplifting, dynamic and bold it snags your attention while living within a swagger to easily show its personality. After we understand the easy use for each track we can move to the true beauty of the album. It is not hard to listen to Stuck In Your Riddle but by simply listening, you’re not hearing. To hear Stuck In Your Riddle, you’d find a genuinely talented man behind fantastic tracks. Proof coming in the form of the last two tracks of the album “Runaway.” Yes, there are two alternate versions of “Runaway” to cap off the album. “AJAX Remix” and “DJ Lynnwood Remix” don’t just remix the track; they speak volumes to Finck’s mentality. To which my hat is off. Blowing my expectations out of the water, Stuck In Your Riddle firmly plants a fist of “honest talent” to cheek of “canned production.” Finck proves you can be expansive while keeping true to your style. This entry was posted in Reviews and tagged Jerad Finck, music, nanobot, review, Runaway, soundcloud, Spokane, Stuck in your riddle, Washington by Greg. Bookmark the permalink.